why don't you go to the blue cross/battersea dogs home/somewhere and have a chat to someone there? Personally, I'd steer clear of pedigree dogs. Vet bills are extortionate and the exercise they need goes beyond. 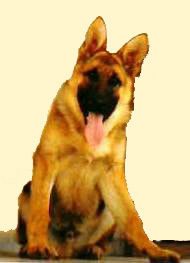 Also, they dont live as long as mutts and tend to encounter far more health problems. What do you suggest I do then? Get a mongrel and hope it turns out the way I want it to? Get a labrador. They are playful, loyal and fun to be with. i dont know how its called! That would be an Alsatian. Beautiful dogs. Why should I call a rescue center? Do you mean I should call the Samaritans? I'm not crazy you know. I'm not suicidal. I'm not suicidal. I'm not sui..
An animal rescue centre, like the blue cross. I don't want a dog that's been rescued though. I'd like an unrescued dog. Why? And even if you don't get a dog from there they can give you advice. You can train ANY dog regardless of breed, regardless of whether its pedigree or not, to how you want it to be. A pedigree isnt BORN tough and protecting, you still have to train it. I'm just saying a pedigree dog is very high maintenance and a lot of time and money has to be invested in it. Even just buying a pedigree will set you back probably several hundred pounds. Please don't get a dog, OP. Go to battersea / another dogs home & take a look round - you'll see plenty of staffies, german sheppards etc.. and this is because so many people have the attitude you seem to have towards dog handling - the nice idea of getting a nice obedient companion to also look scary & protect them :|. The reality is quite different, these breeds are prone to being aggresive - which, trust me, really isn't what you want. People can't cope with these dogs in reality so they get abandoned to the dogs home - its not fair on the animal. Also these aggresive breeds can be quite taken by small fluffy things - really not the best thing to bring into the house with your two persian cats. But now i really think you should definately NOT get a dog. Stick with the cats, please, cause it simply isn't fair on the dog. they do need at least 2 walks a day, and they need a proper routine, and someone with the time and patience to spend with the dog training it - it doesnt seem like it would suit your busy lifestyle, nor your attitude towards keeping a pet. If you do get a dog, it will be a very selfish decision IMO. Are you actually trolling? Some of your opinions seem quite unbelieveable to me. I really truly hope you're not serious by some of the stuff you've said. "Don't breed or buy while shelter pets die"
No, I'm pretty much not trolling. The only things which I've said which could be construed as ridiculous would be not taking my dog out for four hour walks. I think that's quite reasonable. I don't get that much time a day for me to waste four hours walking a dog around. I don't think I'd find it too pleasurable. I love the Akita though. I want one of those. What would be the difference? Its still a dog. Only by adopting a rescued dog you'd be, well, rescuing it. So many dogs ad puppies are abused and abandoned each year, I really think you should consider it. What are bengal cats like as pets? Getting a dog.. what breed should I get? Thinking of getting a dog...Need some dog owners advice please! Dog attacks: should it be mandatory for all dogs to wear muzzles in public areas? Which dog breeds can be left alone for 8.5 hours a day?